Ever think about the smells of a drive? You probably haven't because you roll up your windows, pop on your air and cruise at 75 down the Interstate. Oh the sights attract you. You probably have a CD or 2 or 3 ready for the changer or you button punch until some radio station comes into range that's playing close to things you might want to listen to for the next hour or until the signal disappears. But, I'm betting you've never thought about the smells of the open road. I come from an era when air conditioning in a car meant opening all the windows and driving 60. Smells were everywhere. The Jeep doesn't have air conditioning. It's an "open the windows and drive 65" machine. On the way to Virginia, the wind was chilly so I spent most of the drive with the windows half open. On the way back, however, I was driving into heat, so the windows were open. There is the smell of hot pavement. There is the smell from a semi full of cows, hogs or chickens. Chickens are the worst. Trust me on this. May you never find yourself stuck behind a truckload of chickens. The air rushing in through the windows brings the smell of haying in the fields, the smell of dirt, the smell of rain if you drive through a storm. I love the smell of freshly washed earth and the smell of driving into and out of a rain storm. I came upon this as I was heading home on Thursday. I had to follow him for a time because we were going uphill, into the mountains, in western Maryland, and the Jeep had slowed. At first, that natural slowing; how dare gravity tug on my vehicle; annoyed me. It was costing me valuable minutes in travel time. But then I realized that I got a better look at the scenery and had a chance to smell things I'd have passed right by. Why is this important? 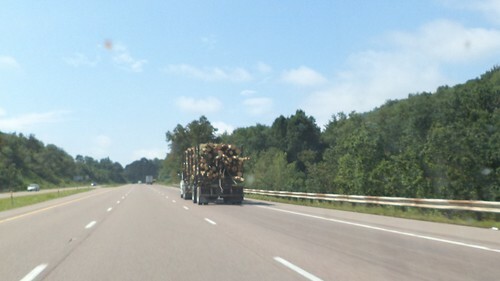 This truck was hauling reasonably freshly cut pine trees. It wasn't quite like the smell of Christmas as there were diesel fumes mixed in with the pine scent, but it was close enough that I didn't mind being behind him until his speed dropped to 50 and I could easily pass. In two months, the truckloads of Michigan fir trees will pass through the Chicagoland area on their way west for Christmas. For some reason, those don't have the smell this one load had. Made me remember that I really need to get back into crocheting scarves for presents.